From the simple cut to the sweet cherry print, I knew it was only a matter of time before I bought HVN’s cherry Lily dress. … but, I didn’t think I would order it online, sight unseen. $445 USD is a lot to spend on a dress. It’s even more to spend on a dress that you have never tried on, let alone seen in person. My only concept of HVN’s Lily dress was from the description on HVN’s online store and a picture of Lily Aldridge wearing it. … but, visions of pattering around Panama in it persisted. I emailed Harley Viera-Newton’s team to ask if it was indeed super sold out. Within a half-hour Kate let me know they were receiving one soon and that she’d keep me posted. I spent the week mood boarding the dress to make sure that it would fit my style. The rest of my time was spent humming and hawing if this dress would 1- fit and 2- be worth $445. Then I got the email: it’s in stock! My Mood Board ft. Kate Moss, Gia Coppola, Lily Aldridge… and Captain of the dreamboat, JFK Jr. So, I jumped and ordered it… then felt more nauseous than when I ate Flamin’ Hot Cheetos on a hot dog. I just spent a $445 on one single dress. Without ever trying it on. Or seeing it in person. What was I thinking? Let’s put it into perspective… For $445 you could buy 30 cherry pies, or 89 pints of Cherry Garcia ice cream, or 263 pots of FAGE cherry yogurt, or 445 cans of cherry Diet Coke… I clearly have a healthy diet. When it arrived in the mail, the cherry flavoured Gravol finally kicked in. My nausea subsided. Here’s my review of how and why I’m justifying my HVN dress… along with my normal sizing tips and pros & cons list. In HVN’s Lily dress I took a US size 2. I’m 5’5.75 and weigh 115-117lbs (I give my specs because it’s useful). This dress fits beautifully in the body, but bigger in the bodice. If I had tried it on in store, I probably would have gone with a size 0. The straps are adjustable, the more you adjust them, the higher they go and the tighter they become (duh). When I adjust them super high, I’m happier with the fit. I love how long it is though, just half way up my shins. It has a subtle slit in the back too. The Lily slip is 100% silk and was made “with tender lovin’ care” in Korea. The silk is like a heavier silk chiffon — but not too heavy! It has a subtle sheen on it and breathes so easily. It’s like a silk chiffon meets silk satin… It’s actually pretty similar to Réalisation Par’s Ozzie dress’ silk. I’ve worn my HVN dress during the day and in the evening. Despite being paranoid about spilling something on it, I haven’t had any issues with its quality. Basically, this cherry print dress does the heavy lifting for you. All you need to do is bring your shoes & bag to make it your own. Cherry print dresses have been at the front of my mind since last year. I tried Réalisation Par’s Christy dress in cherry print, but the cherries were too big. I sampled Reformation’s Abigail dress in “tart” print, but there weren’t enough cherries. HVN’s cherry print is a step above the others. There’s a generous serving of cherries, a subtle detail of a shine on them, the red is vibrant but muted at the same time, and there are three varieties dancing around the fabric. This cherry print is less graphic and more of a 1940’s dream. –100% Silk: I love natural fibres. 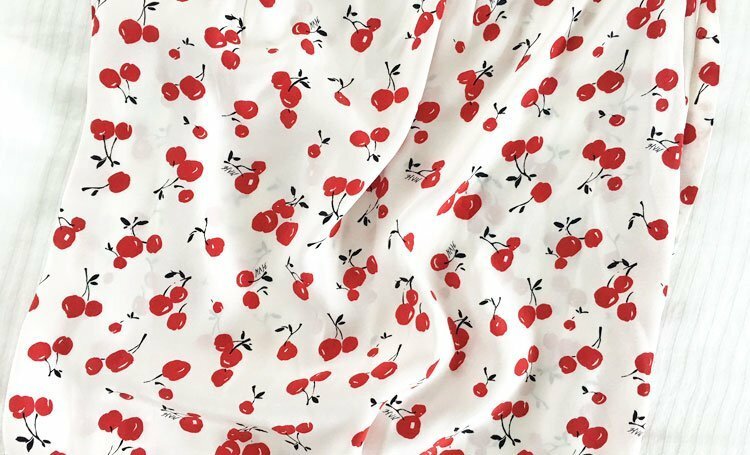 –Print: The cutest cherry print I’ve ever seen! –Timeless Cut: At the end of the day, the Lily dress is a classic (but longer) slip dress. –Super Classy: Maybe this goes under timeless cut… but it’s like an Embassy garden party kind of classy… while still being cool and wearable to the dive bar after when you’ve had enough of finger sandwiches. –Great Customer Service: I was surprised they remembered to get in touch with me about the dress considering I’m not anywhere near the A-list status of Selena Gomez or Margot Robbie (or their stylists). –Packaging: Packaging is a tricky topic because some argue that excessive packaging is bad for the environment. I argue that I keep all those Net-A-Porter & Matches boxes to store things in. My HVN dress was wrapped in tissue paper in a USPS paper padded envelope. It did not feel like I was opening a $445 package and left me slightly disappointed to be honest. Note: I recently purchased a mini Lily slip (gold lame, if you were curious) and they have changed their packaging to a branded mailer box! –Addictive/Price: Basically, I want need more HVN dresses now… but a $445 dress habit is not a welcome addiction in my life right now. HVN dresses do go on sale, but very few make it to outlets like the Outnet. lol HVN dress, y u so funny? HVN makes enough clothes to fill the demand, but they don’t go overboard. While helping with the excess of clothes in the world, it creates a more timeless feel… If the Lily dress was listed everywhere and made it to outlets in mass quantities, there is no way I would buy it full-price. While it’s a big price, I know this dress will be age-appropriate for a very long time. I’m 26 now and I imagine it’ll look just as good (as long as I stop eating Flamin’ Hot Cheetos) in 10 years when I’m 36. How uncool to say, but seriously. The cut and print are just so timeless. … like my Acne Kelly green suede moto jacket (2009), amongst some others. I don’t remember how much these clothes cost, but I do remember how they made me feel when I first wore them and how they make me feel when I wear them today. … and I can’t wait to make memories in my HVN Lily dress. Now to find their matching cherry scrunchie…! HVN dresses are available from Moda Operandi (where you can save 10% off your first order) or Neiman Marcus also carried HVN and you can save 15% off your first order if you sign up to their newsletter. Do you have any clothes loaded with memories that you’ve loved forever? I’d love to hear about your closet in the comments and let me know if you have any HVN questions!